PART 0 - THE CAMPAIGN IN A NUTSHELL What is happening? When? Who is in charge? How the activity will be organised? What is to be sent to ERYICA? What will be the outcome of the Activity? What Any Activity to support the Campaign‟s aims! This kit is to guide and support you into the Campaign “Information Right Now!”. Important note: do not be afraid from the number of activities included in this booklet. These are for your inspiration only! Any activity counts for the success of the Campaign, be it small or big. What is important is to document it and share its content. Social inclusion of young people; Democracy, including e-Democracy; Living together in diverse societies. people‟s access to rights and – eventually – on the access to information as a right in itself for all young people. 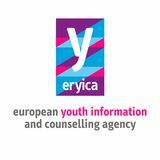 In October 2011, representatives of ERYICA Member Organisations were invited to a preparatory meeting in Strasbourg to kick off the planning of the campaign. Much of the content of this tool kit was initiated at this meeting and later developed by ERYICA with the help of representatives of Member Organisations along with external consultants. The campaigning activities put forward in the tool kit are examples based on different campaigns across Europe and have been collected and presented by Åsa Gunven, civil society consultant specialised in advocacy and campaigning. 1.3 Objectives of the Campaign The campaign has three general objectives that we aim to achieve trough different campaigning measures. The campaign objectives are: 1. Young people to understand they have the right to information. Not all young people know they have the right to information of quality and, as a consequence, they cannot request the information they need. It is an objective of the campaign to increase the recognition and visibility of YI, especially among youth. 2. Young people to understand they have a right to information and MOVE them to find it in the Youth Information Centre (YIC). YICs are crucial providers of YI. It is an objective of the campaign that more young people will use the available opportunities to get qualitative YI at the YICs and generally increase the visibility of the YICs among those who deal with young people, such as the schools, parents, authorities etc. 3. Together with young people, ask decision makers to guarantee their right to information. The right to YI of quality has to be guaranteed by adequately implementing policies and allocating budgets. In particular by including YI in the Final Declaration of the Council of Europe Conference of Ministers in Charge of Youth (St. Petersburg, September 2012) as well as in the new EU Youth Programme as it will be drafted in the next months by the EU Institutions. THINK ABOUT! It is important to identify internal/organisational objectives that could be fulfilled in your member organisation, and especially analyse which ones of the internal and external objectives are the most important ones (prioritise!). For example, if you are running the risk of losing all your grants the most important activities in your country might be to do advocacy towards decision makers (objective 3 above) In another country where they identify that the most important internal/organisational objective is to reach out to young immigrants that don‟t visit the YIC, the most important focus might be Objective 2 above – to get more young people to visit the YIC – and the campaign activities could be focused especially towards young immigrants. Like this you should plan the campaign so that it fulfils your needs and goals, also when it is part of a bigger pan-European campaign with specific objectives. EXAMPLES OF INTERNAL/ORGANISATIONAL OBJECTIVES THE DIFFERENT MOS HAVE IDENTIFIED;  More exposure and visibility;  More funding;  Reaching out to more young people/new groups of young people;  More networking, both internal and external to your national network;  Activating and involving young people in your work;  Start using more innovative communication tools, in order to ensure more impact and share these ideas;  Increased cooperation with the whole ERYICA network;  Capacity building on campaigning;  Strengthening the credibility of the network and becoming a strong partner to institutions as well as a point of reference to media and other actors;  Launching concrete projects among ERYICA members for the campaign;  Empowering young people to ask for their rights; 1.4 Timeframe of the campaign and important dates relating to the campaign The campaign will run from 17 April 2012 to the end of 2012. The following dates are important to take into account for the campaign – both in terms of organisation as well as symbolical dates and momentums that can be used to organise activities around. THINK ABOUT! The one that points too broad might miss the target. This means it is important to always define who your target group is before you design the activity/campaign material etc. A campaign is composed of several activities and each of them can have different target groups. Also the same activity can be divided up in different sub-activities, each with a different target group. EXAMPLE: You are organising a workshop with young people outside the HIV info point, building a sculpture out of condoms to raise awareness about HIV and to protest against the cuts being made to youth information in the municipality: Sub-activity Invitation to schools to take part, including an info brochure The workshop Press release Handing over the sculpture to the mayor at the opening of the new youth centre. 1.6 Message of the campaign While identifying the message of the campaign the 3 objectives have to be taken into account. Here is an outline of the message directed to different target groups, as well as examples of arguments that can be used to promote them. It is important that you also take time to think of specific arguments concerning your country and, generally, your reality. TARGET GROUP: YOUNG PEOPLE Especially when you are targeting young people, it is important to see that the message is something that they strongly care about. Remember that out there a great deal of activities and messages from a variety of directions is competing for the attention of young people. Why would your message be the one they react upon? Campaign Objective 1 - Young people to understand they have a right to information. 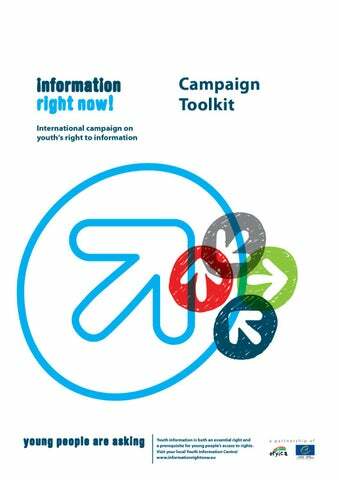 Campaign Objective 2 - Young people to understand they have a right to information and MOVE them to find it in the YIC. Message: There are more and more questions that need answers. You have a right to receive answers to your questions. The Youth Information Center is there to provide you with answers and guidance – just come in! Slogan: Right to Ask, Right to Answers TARGET GROUP: DECISION MAKERS Remember that decision-makers need to be convinced that your objective benefits not only you, your youth information structures and its workers, but also young people and the society overall. It is not enough to state that YI is important; you need to provide evidence and arguments! Thus, before involving decision makers and politicians ask yourself:  Does the activity provide good visibility for the decision makers and politicians talking part in the event?  Does it justify public intervention?  Do we have enough arguments to sustain our claims?  Do we offer an advantageous instrument to support policy, that is costeffective and brings results? Campaign Objective: Together with young people, ask decision makers to guarantee their right to information. Message: Youth information is a prerequisite for all other rights of young people and it needs to receive special support to enable access to all other rights. It is also a prerequisite for a successful implementation of all policies for youth, such as education, employment, or health. Youth Information Centres provide young people with a valuable support in finding answers to their questions; they operate in a face-to-face, personalised environment in which every individual is respected in his/her specificity. This is especially needed in a context such as the current where more and more information is available, but not all of it is of quality and where pre-selection and guidance is crucial to find the right answers to young people‟s questions, also in online environments. Youth Information Centres provide quality information, professionalism and adequate guidance and counselling at once. Slogan: Information Right Now! Young People are asking! PART 2 – ACTIVITES TARGETED TO YOUNG PEOPLE AND THE GENERAL PUBLIC The target audience “young people” is very broad and, at the same time, it has specific characteristics. It is easy to understand what channels can be efficient, such as young radio stations, Facebook, schools etc. In the same time, in order to have any kind of success with such a broad target group, a very large number of people have to be reached. Therefore it becomes necessary to see the campaign as part of a longer strategy to reach more young people. It also becomes necessary to think in terms of using multiplication tools. To make a public action is a way to make a statement together with young people in order to multiply the message. The goal would be to raise visibility of an issue and possibly get media attention, as opposed to only reaching the people actually participating in the activity. It is also a way to offer a space for participation for young people and send the message with them to the decision makers. Activities that only involve the actual participants of the events are not normally campaigning action but rather they represent normal activities. This does not mean you shouldn‟t try to communicate the message of the campaign inside all the events you do and, as pointed out in the visibility part, also in the events of others. Moreover you might want to brand some events you do with the campaign and, for example, to include them on the web to make the campaign look big and impressive! Here below it follows an outline of several types of tools that can be used in a campaign targeted to young people. What is important is to further develop them as to fit into the local reality. THINK ABOUT! CLEAR MESSAGE – Will everyone understand what the message is about? Is the message understandable and meaningful for the target group or does it make sense to change it/make it more concrete? You can also clarify the message by using a banner, put up a descriptive note, make handouts/flyers that describe what you are doing and why. Go up to people (preferably among your target group – young people) and ask if you can give them information or involve them. In the same way it is important to explain the meaning of the action, as well as its background with a press release. Location - The campaigning impact will be different depending on where you do the activity. person or a politician to your action in order to raise the media attention as well as to do advocacy to him/her. Also it is important to use the momentum of a political process or external event – ask yourself “why would this interest people right now?” Use personal interaction instead of static methods - It is always better to approach people directly than to wait for them to come to you. If you have an info point, or even an interactive tool, you need to have volunteers who go to invite people to get information or get involved. Sometimes you don‟t even need more than this simple interaction to send your message. If the volunteer goes up to a youngster and says “visit the YIC – do you want more info?”/ “Can I give you a flyer about the YIC and its careers guidance service?” the young person will have understood there is a YIC even if they don‟t feel like joining your activity/go to your info point. Exactly the same logic of going up to people directly with a short statement or a hand out applies if you are inside a conference or you have an info table at an event. To reach the big numbers you should try to approach groups instead of individuals. Use young people to reach young people - Usually young people are more inclined to listen to the message from a young person. Try to get volunteers, preferably those that have been going to the YIC to be your messengers. Plan B? - Lets say no one wants to take part – do you have a group of volunteers you can count on? The flash mob could probably be done with few people – especially if you pick an interesting place to do it. The idea of a chain that only runs 10 meter is not that attractive. On the other hand it would be effective if symbolically it was blocking the entrance to some specific place… The bottom line is to think about how to make the event a success, even if few people turn up, and to realistically assess what is the minimum amount of people that you can count on coming. Combine it with a visibility action. Public actions, unless very radical actions that have not really been included in this tool kit due to the nature of the network, don‟t necessary catch the attention of a large number of people even if they reach more people than a workshop. Try to combine them with a visibility action where the message can be sent to a larger number of people. Use a big banner with your message and hand out flyers to back it up. Use humour. Use humour to catch more positive attention! Final questions to ask yourself Do we have volunteers? Is there a momentum? Are this issues people care about? Is it clear that the YIC is advertised? Is the time invested justified? Can we have greater output? Animated symbol/banner for all YIC websites; Interactive video: users can fill in a message; Giving „commercial‟ news to websites that are already popular among YP; Petitions; Flickr photo-stream; Video competition; Phone application about the rights of YP: at what age you can drink, sleep at a hotel and so on. Others demonstrations; Street parties; Festivals; Summer camps; Educational fairs and other fairs; Locations where your target group is found on a permanent basis such as the beach, university, Tivoli etc. something in front of the crowd. You can also make a competition out of this. Poetry slam or rap battles are creative ways of having debates and discussions about a certain topic. Give an overall topic to the competition and invite youngsters to create their poetry or rap around it – either prepared or improvised. It might be good to team up with a group that does this on a regular basis. Creative handouts – you hand out interesting giveaways. For example a group of Greek youngsters handed out Greek yogurts with a “note of content” that described the benefits of the European constitution, in order to campaign for a yes in the Spanish referendum. Example: Belarus action – every year hundreds of young people over 100 cities worldwide put muzzles on statutes, symbolically preventing them from speaking, to demand a free Belarus on the anniversary of the “Belarus elections”. Human marketing – people/youngsters emphasize an idea with a message to the public; T-shirt, creative costumes etc. Spray the slogan of the campaign on allowed places in town. Spray only a teaser first, then arrows towards the YI. 2.4 Interaction; Street referenda & petitions When campaigning it is always important to directly interact with your target group and make them think and take a stand. A simple way to do this with young people is to ask them to sign a petition for or against something. Another way is to set up a street referendum where you ask people to vote for or against something. It is often easier to get someone to sign against something that feels urgent. On the other hand the message is usually more likely to have an impact if it is in favour of something. The interactive methods have two effects: an effect on the person that is signing and an effect in terms of doing advocacy to decision makers. With a very short interaction you start a thinking process and you can also offer further information. Afterwards you make public the outcomes of the petition or street referenda and you might also make an appointment with a decision maker to hand over the results. Like this you campaign towards young people and, at the same time, you use the outcomes to do advocacy. Think about a minimum number of participants you want to reach. This is important especially if you want to use the results for some statistical purpose. What is important is to pick a location where you can find your target group – outside the university/school, by the youth centre, outside a shopping mall. around Europe in schools, libraries and universities, in order to raise awareness about the neighbouring countries. For a campaign against visa, a workshop was done together with mentally disabled young artists to paint a ten meter long symbolic Berlin Wall to symbolize the barriers that run between youngsters in Europe because of Visa or handicaps. The wall was then used in Brussels and across Europe for various media manifestations. The exhibition that will be done at the Campaign Day Action with pictures of “?” from across Europe can also be used in these exhibitions – either on its own or together with someone else. The YICs; Libraries; Schools; Universities; Youth centres; Cultural centres; Youth clubs; Sport clubs; Cafes, pubs; Municipality and public administration buildings; In companies‟ premises, counting on their good will to support the action. 2.9 Workshops with public output Planning an activity with young people does not necessarily represent a campaign event. However, if you make the same event but connect it with a communication measure it can be a useful contribution to the campaign. What is important is to highlight the symbolism of the activity and the actual message. Usually this can be explained trough a press release, handouts and flyers. Here are some examples of what can be done: Street art - Street art is a creative way to include passers-by, especially when targeting children and youngsters. An art project is exposed in a public space and passers-by are invited to join in for creating the art piece that is usually of a gigantic dimension. It can be done by recycling, by chalk to paint on the ground, by humans. The important thing is that it communicates a message and that this message is clear to the people joining in, as well as to those who see it. EXAMPLE; ď&#x201A;ˇ An artist started building a massive art piece on a central square out of 1 cent coins and people joined in. He filmed from above how his work grew, as well as how the police in the end shovelled it away. ď&#x201A;ˇ A theme can be given and youngsters can be asked to send their pictures from this theme to a central web page. Treasure hunt - Make a treasure hunt for young persons, walk them around the city, using interesting questions or tasks, and ending up at the YIC. You can also invite school classes to take part. This can also be done on your web portal in order to get youngsters to familiarize themselves with it. Blindfolded rallies - Make a blindfolded rally where people are invited to run down a slalom track, blindfolded, in competition with each other. The race can be done with or without leading guidance from friends/volunteers. The rally can symbolize how hard it is to get to your goal without access to information. As it is made on a public space you will have the opportunity to present to the general public what the game is about trough flyers or banners. have a follow up meeting planned, an event where the person can be invited as a speaker or guest, a request to become a patron or something else. This might of course depend on the feedback during the meeting. Generally politicians like to be seen, be able to take a position for or against something, but not to spend too much time â&#x20AC;&#x201C; this is also how you have to design the follow up meetings. Anyone can do it - Some people might feel they are not skilled enough to do campaigning towards decision makers but really anyone that has an opinion on a certain topic can do it! The main aim is to raise attention on a subject that the decision makers might be unaware of â&#x20AC;&#x201C; it is nothing more complicated than that. Still many believe they cannot do it â&#x20AC;&#x201C; if you or your volunteers feel uncomfortable, make sure to start with a campaign activity that you feel comfortable with, and see how it goes. Press work - Always follow up your advocacy action with a press release, be it just to report on a meeting or a bigger event. But also do press work after the government has done something that you campaigned for to put attention to the success of your campaign and as an appreciation towards the decision makers. If your institution is part of the governmental structures you can connect the message with the European/international campaign to avoid putting the focus on you. More on press work in Part 4of this Tool Kit. 3.1 Open letters and joint statements Open letters - You have an idea, a demand or a solution and want to make it public. The first and easiest step might be to issue an open letter where you present your position together with your arguments. Here it should also be clear what you demand and from whom so that it gets very concrete. Put forward the problem, the solution you have and the arguments in favour of this. It should not be more than one page in total. You might also involve other organisations, researchers or public figures in drafting, or at least co-signing this open letter to give it more weight. Once you have the letter you can start using it. Joint statements - A joint statement is simply an open letter supported by more partners. This is efficient if you have more people that stand behind a demand, making the message stronger. Often it is a big advantage to be a neutral body, to coordinate a joint statement/open letter between different partners. For example you as YI experts can coordinate an open letter (see above) that is signed by all political parties, or all political youth wings. A demand that comes from all political colours has a large political weight. Publicise it on your webpage and those of your partners; Send out a press release presenting the content of the statement and explain what you are going to do with it; Hand it over to decision makers and institutions – preferably in person, but otherwise by mail or post; Send it to the political parties, and as it is about youth issues, to the youth political parties. Ask them to publicise it in their newsletters. Ask it to be publicised in webzines, blogs, web portals of partners and organisations/people active in the same field; Ask organisations/partners to include it in their newsletter; Write a common article based on the content of the joint statement (that is not really written as an article) and present why you made a public statement adding more background facts. deadline. Include all logos in the final version and write a press release to go with it. 4. Invite all the partners to spread the joint letter trough their communication channels and their press databases. Make sure that you also do the same. Especially make sure to send it to the relevant decision makers and institutions. You should mention this in your press release too. 3.2 Participation in public debate â&#x20AC;&#x201C; simply ask a question A very effective way to put your message across several stakeholders is to simply visit their events and, at the end of the discussion/speeches, put a question that draws attention to your issue. Remember to present yourself as coming from the YIC, put yourself forward as an expert in the field (you are!) and put in as many background facts as possible before posing the question. The question can be asked in order to make the decision maker to take a stand on the issue, but it can also be put simply to raise the attention to the issue in any way. To make it very authentic you can send a young person, for example the youth ambassador, to ask the question. Whoever is going doesnâ&#x20AC;&#x;t need great knowledge, it is enough to state an opinion or ask a question and, if they need backup, you can help them by preparing this in advance. The advantage of this method of advocacy is that it takes very few people, very little time and actually no financial resources, to reach many decision makers and stakeholders. From the side of the office it might be good to keep an agenda with all possible events to visit. You can then coordinate different volunteers and staff members to go to one or two events and, if needed, you can have a small conversation beforehand to talk about what kind of questions could be raised. YOU should also make public the outcomes, especially if you get an interesting response. You might even make a press release about this or organise a follow up meeting with that person. EXAMPLE; Before the European Parliament elections a small group of activists were coordinated to visit around 30 events/debates in Brussels in order to raise a certain issue to the political parties. Each person only invested around 4 hours time, but jointly they managed to significantly raise the profile of the issue within all political parties. HOW TO DO AN INTERVENTION STRATEGY 1. Get a small group of people together. It can be you and one other colleague or it can be a larger group of volunteers where each commits to visit 2-3 public events and make an intervention. Try to have someone that can work as a back up and visit all the events other don‟t manage to cover. 2. It is good to have a prep meeting with the group to create a team spirit for the campaigning and also to share methods and strategies about how to make good interventions. 3. Set a goal about how many events you want to cover in what time span. 4. Make an agenda with all events worth visiting – pick those where decision makers are present. 5. Ask people to volunteer for the events and also follow up asking people specifically to go to this or that event. 6. Back up the people that are going by giving them an input to what kind of point to rise or question to ask. 7. Ask everyone to report back on who they meet and what they asked for the records and, of course, make public the outcomes! Again, explain that this is something we are doing all over Europe to raise the debate about the issue – this is actually quite impressive and shows above all the European wide debate this is part of. 3.3 Ask questions by mail or phone The most important thing in advocacy is to get a direct contact with the decision maker. You don‟t have to say what your objective is or to share your own opinion, but just simply show an interest in their work/opinion. Send them an e-mail or call to ask about their standpoint on the topic and potentially ask if there is a possibility to further discuss it. Share your knowledge/experience on the topic. The main thing is to raise the profile of the question you are trying to highlight. Try to include something in the letter that the decision makers have to react to, for example an invitation, to make sure the letter reaches further than the assistant. It is good to highlight that the issue you are raising is part of a European wide campaign implemented by CoE and ERYICA to show the importance and urgency of the matter. Send an attachment with more information about the campaign and the joint statement summarizing the issue (if any). You can ask members or volunteers that are also members of a particular party to raise the question directly with their representatives. As members they might have a direct link to the decision makers. Make a follow up call and maybe invite the person to one of your events. An “opening” - you can use the occasion of opening a new photo exhibition in the YIC to invite a politician, and once he/she is there you can also take the chance to present the open letter you have done, or explain about the campaign you are involved in. Offer a reality check - You might also simply invite him/her to a meeting with youngsters and provide him/her the opportunity to learn about their experiences. This is a way to offer a reality check for the politicians in the youth field. You can take some nice pictures showing them interested in marginalized youngsters, this increasing their advantage as voting figures. On the other side, it is also a great opportunity to promote the work of the YIC and YI. Show the importance of the event and how much visibility the decision maker will get out of it. Again, it is useful to say it is part of a European wide CoE and ERYICA campaign/project. Make sure the timing suits them. When do they normally have time for events and how much time can they spare? Phone their secretariat and say you like to discuss a suitable time before you send the official invitation, or mention on the invitation that you are open for changing the time. If the invitation is turned down you might follow up with a phone call to share the outcome of the event and be able to put forward your message. Think broad about whom to invite – the director of a school, a public servant working with the issue and so on. 3.5 Create messengers You can invite a decision maker to stand up for your demand by creating the space for them to support your agenda. With this positive approach “of course you as a good politician already support the issue of…”as opposed to “we demand you do this” which is a more negative message, you can get a more positive effect. If you want a politician to do this you might try to cooperate with a youth wing of a party that would like to increase the youth issues inside the party, being more willing to help you on this regard. EXAMPLES; Here some example of how to make a decision maker support you in public. Patron - An easy way is to ask for someone to be your “patron”. This means they officially support your campaign, your cause. This can then be used in all communication work to increase the profile of the campaign, but especially if you have a 100% loyal decision maker that will support this cause – that s/he might not even have been aware about before you approached him/her. Tell him/her the international dimension of the campaign and that CoE and ERYICA stand behind it for him/her get more interested in becoming a patron. Messenger – You can organise a discussion or debate about the importance of youth information where the decision maker is on the panel/in the roundtable. S/he will then become a messenger of your agenda. Sending a photo collage/picture of an important project you‟ve done presenting the outcomes; Send a painting on the topic made by children; Send a fax with a creative design image and your message included – be clear about your message, don‟t hide it. 3.7 Testimonials The decision makers need facts, but they also need personal stories. These personal stories are what they remember and also what they can use in their speeches. Provide them with these testimonials by bringing young people to them, telling their stories. A young person coming from low, exiting at high – that is a success story that the YIC helped to create. The aim is to make them act and you have to show them what actions are possible. Make a proposal stating what needs to be done. “by voting this in the parliamentary next week…”, “by asking this question to the government…”, if your party takes this stand at the party congress…”. Bring something to show them, results of something, statistics etc. Bring it also in printed format to hand over. Also bring information about the Campaign that highlights its European dimension as well as the work you do. Give them something to remember you. If you don‟t have anything interesting to show them, organise the meeting together with someone else as a researcher or another NGO. Like this, the decision maker feels he/she will get more information out of the meeting. Tell them you will publicize the meeting on an international campaigning webpage to show the importance of their support. PART 4 - CAMPAIGNING TARGETED MEDIA 4.1 Write expert articles Remember that you are an expert in this field. This makes your input valuable both to the media as well as to decision makers. In the daily press you cannot contribute directly but often in specialized media experts are welcomed to contribute with articles. This is especially so in online media where the space is not limited. In these specialized media you also have a much narrower readership that often include many decision makers. You might also ask blogs or shared blogs on the topic to include your article. Share your experience and your knowledge as well as put forward your ideas and solutions in articles. A few hours work can then directly reach many thousands of readers that belong to your target group and, on the long run, it might also help to profile you as an expert who is asked for advice and increase your influence on this area. 4.2 Write letters to the editor Many newspapers have “letters to the editor” where anyone can write a contribution on a topic. Preferably it should be a reaction on something that has been written in the same paper. Look at the tips given below in “ HOW TO DO IT” for inspiration. 4.3 Get in the radio or TV sofa Certain types of media are easier to access. Certain radio programs are very accessible as they are closely related to the topic. Of course radio programmes that young people listen are also an excellent way to reach directly our target audience. Also it is quite easy to get into the morning shows as they run for several hours every morning and simply have a problem to fill up all this time with valuable content. Important is to make it attractive to them – TV means visual images are important (as a public action) and also the debating dimension, that you don‟t only want to say what you do but why it is important, and why there is a problem right now. This is a good occasion to bring with you your VIP ambassador, but you can also bring a researcher or a young person to make it more interesting. 4.4 Reactions in the media Try to keep the media and blog sphere monitored. When you see an article that corresponds directly or indirectly to your area you can write a comment to the article. It can be really short, just to highlight your message (in whatever angle is more suitable) and it should preferably include a link to where more information can be found. A quick and effective way to put your message out there! 4.5 Use blogs Make an overview over all bloggers you know and that are connected with you and ask them to cover your issues. Also make a list of blogs that deal with your issues and keep track on their discussions. You can always contact them and send them your PR, or comment on what they write. don‟t necessarily have to have someone directly connected to the YIC, it might also be the director of the youth department, a researcher, journalist you know. You can also have the article co-signed by several persons. It is always easier to get someone to sign the article if you first write the draft and hand this over as this involves much less work for the “high profile” person. But also if no one else signs it you are likely to get it published, so don‟t be discouraged. Just about anyone can get published if s/he has an interesting idea or angle on the article. Spread it. Once the article is publicised you should try to spread it to multiply its effect. Ask other web portals, webzines do double publish it (always including an indication about where it was first publicised). Include the link in newsletter and ask others to do the same. The first one to publicise the article should be the most important journal/magazine as they are unlikely to publish it if someone else already has. Press archive. Keep a press archive, also on your webpage, to keep track on where you have been visible in the media. Where? Some ideas on where to start: Women‟s magazines (mothers as multipliers, easy to get in); Educational media (multipliers); Student/pupil magazines (young people); Local/regional media (make the news local); Newsletters (easy to get in – think broad about whose newsletter); Teachers magazines (multipliers); The magazines of political parties/youth wings (reach decision makers); Online media (easier to get in then printed media as more space); Format. Keep it as short as possible. A PR should be no more than one page and an article 1-2 pages (many magazines will give you a word count indication). Make sure to include quotes from important persons as well as young persons. Especially to get a journalist to write about you, as would be the purpose with a PR, this is the most likely way they will include what you have to say by using one of your quotes. It is not rare that a PR is made out of 95% quotes. Don‟t forget to include your name, a contact person, and web and contact details. If you are making a PR about an event, you can also summarize the facts in a “fact box” at the beginning. When to send a PR? The press communication looks different in every country. As a standard you can say that it is good to send out the press release 7 days before the event with a 3 days reminder before the event for media‟s planning sake. Try to send it out before 10am. If it is an activity also send a PR with some pictures right after the event the same day. Create a giant question mark in a strategic public place – the beach, the town square, outside the parliament, outside the YIC – together with young people. Use creative materials such as recycling, balloons, the bodies of youngsters, all brochures that exist about studies showing how impossible it is to guide your way through it by yourself. Make many small question marks and put them all over. Make a huge question mark on a billboard and ask youngsters on the street to write down the questions they have. Put it in a school, on the street or outside the YIC. Ask youngsters to write down the question they have and build a question mark out of this. Make a photo competition where you ask youngsters to make the best photo including a question mark. Make a collage of several pictures of question marks that is jointly shaped into a question mark. Exhibitions in the YICs - A photo exhibition will be created out of the gathered pictures to be exhibited in YICs around Europe together with an info poster explaining the background of the action and the campaign. ERYICA will get a very visual and creative presentation of the campaign and its international character. Of course the exhibition will be more powerful if more YCs take part in the action! You can also promote this photo exhibition to be put up in other places such as libraries, schools and public institutions in order to emphasize the campaign and the work of the YIC. Online - The photos will also be exhibited online to spread the word about the campaign. This is, of course, also the tool you can use to spread the pictures and information from the campaign activity in your country. You can also use the pictures for future activities – online or offline. Why not use them as an image for a Facebook page where you ask young people to share what question marks they have? Use the pictures yourself! - Promote them on your webpage, Facebook page or in youth centres. Hand them over to decision makers in your country. Photo competition – There will be a competition in the campaign Facebook page. The pictures of the different actions will be included in this competition as well. HOW TO DO THE ACTION 1. Decide the format of the event you would like to do. 2. Mail ERYICA to say you are joining the action – this is especially important for the central press work. 3. Prepare an invitation and distribute it over your usual distribution channels. 4. Send out a press release about the action highlighting it is part of a European wide campaign where youngsters all over Europe are building question marks on this very day. A draft PR kit will be provided to you in English. 5. Try to give something extra for the participants – sandwiches, coffee, nice music. It should be fun to participate! 6. Make plenty of pictures and collect the best one of the question mark to send to ERYICA the very same day as the action take place (important!) 7. Don‟t forget to advertise the YIC and its location both in the invitation to the activity, in the event itself and in the press. 5.4 Pan-European Facebook based photo competition A Facebook based photo competition will be prepared and coordinated at the central level. It will be launched on the same day with the Pan-European action, 16 May 2012, and run until end of August 2012. WHO? The competition is opened to all young people around Europe, age 13 to 30, invited to submit their pictures and out them to vote. Youngsters are invited to state their questions using a photo camera. The competition will start with the photos from the Campaign‟s Pan-European Action, done by youngsters or picturing youngsters all over Europe. Also, the young ambassadors will be motivated to take pictures at the training in Malta and submit it to the competition. WHAT? The topic of the photo competition is “Young people are asking” and the participants will be invited to submit a picture with a written line explaining the content of the picture. The voters will be asked to pick the ones that show the theme of the competition in the most creative way. PROMOTING THE COMPETITION The idea is to spread the competition through the networks of the national local YICs and their Facebook pages/groups. The participants will then be encouraged to spread the competition to their friends in order to gather votes for their pictures. The promotion of the competition should preferably take place online as well as offline trough the YICs and their activities. OUTCOME All of the pictures subscribed in the competition will be added to the photo gallery in the Campaign‟s webpage and Facebook page. However, the pictures in the competition that will become the most popular and will receive the biggest number of votes on Facebook, will be exhibited together with the YICs pictures from the Pan-European Day. This picture, among the others, will be used in the exhibition in the Council of Europe and also in Sankt Petersburg. More on the online competition will be presented during the rest of 2012. 6.2 Simultaneous actions If 20 youngsters build a pyramid outside the YIC to show the importance of YI it will catch the attention of passers-by. If youngsters are doing this outside every YIC in the city on the same day it might get the local media, and if they do it in every country across Europe on a day that also has a special symbolic meaning (political, historical…) also decision makers might find it interesting that youth stand up for their rights. Small action can become larger by coordinating them with other actions, as well as coordinating them with political decisions, symbolic momentums etc. You can use this method to put more attention to your campaign, and also as a tool to integrate the work of different YIC in your country or in your region. What is important is to assess the capability of the different groups involved and plan the event in a manner that everyone can take part. It is also good to allow for some variation so that groups can adapt it to their local needs. 7.3 Banners Banners are a good way to put the message of the campaign clearly in all your activities. There are design files in the tool kit you can use to print your own campaign banner. As with the stickers, it is important that your campaigning message is clear from the banner – don‟t put on it only the logo. PART 8 - EVALUATION 8.1 Evaluation Criteria Starting from our Campaigning Objectives we have established several subobjectives that we want to achieve with this campaign. They are established to be SMART – Specific, Measurable, Attainable, Relevant and Time-bound. These sub-objectives, as listed below, will function as the evaluation criteria of the campaign. OBJECTIVE 1 AND 2  To reach 10% more YP trough the YICs in 2013. OBJECTIVE 3  2/3 of Member States, where an ERYICA member is present, governments should find out about us and the issue of YI, making us a point of references on this issue;  YI included in the final declaration of St. Petersburg Council of Europe Ministerial conference;  YI mentioned in the draft for new EU Youth Programme (or equivalent). OBJECTIVE 1, 2 AND 3  Media coverage in at least 2/3 of CoE MS making us a point of references on the issue of YI. ORGANIZATIONAL OBJECTIVES (Medium term objectives are identified on 3 years)  Strengthening of the ERYICA network trough increasing the trans-national cooperation;  One event in at least ¾ of ERYICA MOs;  Medium term – new contacts established in the CoE members states where there are no ERYICA members;  Medium term – a partial prevention of decrease in funds;  Medium term – a partial increase in funds;  Medium term – increased presence in at least 5 of the countries where we have members. 8.2 Evaluation Methods It is important to continuously evaluate a campaign in order to see if the objectives are being fulfilled, the target groups reached, the message communicated and the own organisation involved. This should be done at every level of the organisation. The final campaign evaluation, compiling the results and comparing them with the evaluation criteria, will take place after the campaign has finished in the end of 2012 as well as 3 years after the end of the campaign to measure the medium term outcomes. It will be based on the monitoring of the campaigning results trough a continuous compilation of outcomes as well as an in-depth evaluation questioner with the MOs at the end of the campaign.